Relaxing in your sauna is an amazing feeling with a lot of health benefits. It is the perfect way to clear your mind and rejuvenate your body. However, to ensure that you feel comfortable while in your sauna, you need to control the temperature. If it is extremely hot, you won’t feel comfortable and you might even be in danger. For this reason, you need to have the best sauna thermometer with you. A sauna thermometer is not an ordinary thermometer – it is made to withstand the condition in a sauna and precisely give you info, so you can know when to change the condition. Remember that not all sauna thermometers will be the same, and some might be better than others. The right model should be long-lasting, accurate, well-made, and reliable. And all the sauna thermometers in this review offer these and more features. Here are the top 5 sauna thermometers that you will find on the market today. If you are searching for a sauna thermometer that will provide you with the readings you want, then you might consider The Sauna Place Aspen Round Sauna Thermometer. This is a thermometer that is rivaled by very few sauna thermometers on the market today. 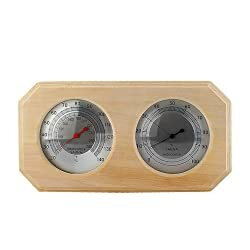 This Aspen Round Thermometer F has a simple but functional design that makes it a great addition for a sauna. In fact, simplicity is the idea behind this thermometer to ensure that all people use it with ease – be it kids or grownups. What’s more, it is one of the most cost-effective sauna thermometers on the market today. This means that you need less than $30 to afford it, which is pretty affordable for people who are budget conscious. Another notable feature of the thermometer is the easy to read gauge. You can easily read the temperature gauge and know precisely what you need to do to continue enjoying your warm sauna. The best part, you don’t need to be near the thermometer to see the readings – it is that clear. The Sauna Place value its customers and that’s why it provides you with easy to reach customer service team. In case of any question, you can air your concern and your issue will be resolved within hours. The developer ensures that there is 100% customer satisfaction by proving a reliable and long-lasting sauna thermometer. This particular thermometer comes with a warranty that will give you peace of mind when using it. Looking for a sauna thermometer that can measure both the temperature and the humidity of your sauna? Look no further than the Fischer Germany Sauna Thermometer F and Hydrometer. This is a synthetic hair hydrometer that combines with a bimetal thermometer to provide an accurate reading of humidity and temperature. The thermometer and hydrometer for the sauna are hand-crafted to ensure that it’s of the highest quality possible. And it is made in Germany by the reputable Fischer Instruments, a company that has been in business since 1945. Therefore, you can rest assured that you will get a well-made product to use for your sauna. Its diameter measures 170 by 170 mm or 6.7 x 6.7 Inches and has a depth of 40 mm or 1.5 inches. Another thing, it is a lightweight sauna thermometer and hydrometer that weighs only 0.8 pounds. To provide you with peace of mind, the manufacturer offers a 2 years warranty that will cover against any defect. But don’t be deceived by the short warranty since this is a long-lasting and durable product. The developers ensure that you get unmatched safety and reliability as well as accurate readings that you have always wanted from a sauna gadget. Going for over $80, it is one of the most expensive sauna thermometers/hydrometers you will find on the market today. But this is a favorable price considering that you won’t need to buy a thermometer and then a hydrometer. Its high-quality also contributes to its high price. 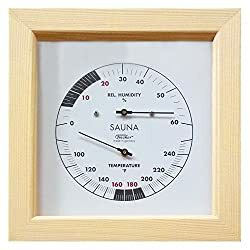 With as little as just over $30, you can easily afford the Eleoption Wooden Sauna Hygrothermograph Thermometer Hydrometer Sauna Room Accessory (Square) A. This is a must-have product if you want to enjoy your time in your sauna after a long day. It is a 2-in-1 product that measures the temperature and humidity of your sauna, thanks to its sauna thermometer and sauna hydrometer. With this product, controlling the humidity and temperature of your sauna is easy and you will always enjoy a safe and comfortable place. This thermometer and hydrometer are made of 100% pine wood that provides not only beauty but durability. It also comes with a wooden display plate that matches well with all sauna rooms’ decors. 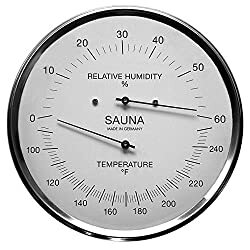 Actually, the sauna thermometer sauna hydrometer is handcrafted from the pine wood with a satin nickel finish and a real glass lens for better visibility. And its installation is very simple; simply mount in on a wall in your sauna and it will be ready to go. Accurate temperature display in Celsius and Fahrenheit comes in handy to assure a comfortable and relaxing atmosphere. It is able to display temperature that ranges from 80-280F and 20-140C. The humidity display range varies from 0-100% humidity. The model is precise, well-balanced, and carefully made to provide the finest details possible. This means that you can easily read the temperature from afar. The model comes with a 3-month guarantee that ensures you get your money back if it doesn’t suit your needs. This model goes for under $30 and has a cedar glass encased thermometer that matches your sauna nicely. Therefore, if you want a thermometer that will be affordable and add décor to your sauna, then The Sauna Place Cedar Encased Sauna Thermometer is the model for you. Its cedar wood frame is of the highest quality possible and will last for long without showing any wear. What this means is that you can have a peace of mind knowing that your sauna thermometer will last for decades while providing an accurate reading. When it comes to the temperature reading, the sauna thermometer is able to provide accurate readings that you can see from a far distance. And cost-effectiveness is not the only good thing about this thermometer since it provides 100% user satisfaction. In fact, you can easily return the thermometer if you find it to be faulty and get a replacement. Its modern design is quite attractive and offers the beauty you have always wanted to add to your sauna room. Another thing, the thermometer comes from a reputable company that has been in business for years. The company is able to provide the best customer service possible and will always answer your questions. So, if you want a product that will be friendly to your pocket and offer value for your money, then you should consider buying this thermometer. It will be the last thermometer you buy for your sauna in your lifetime. One of the best sauna products for 2019 is the Fisher Germany Fisher Sauna Thermometer F and Hydrometer 6.3-Inch. 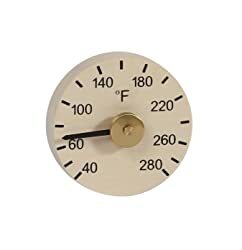 Just like the Fischer Germany Sauna Thermometer F and Hydrometer (6.7-Inch 188TH-03F), this model is a bit expensive, going for over $80. However, it is a 2-in-1 model that will measure both the temperature and humidity of your sauna to provide you with a great experience. It has a synthetic hair hydrometer that is merged with a bimetal thermometer to provide accurate temperature and humidity reading. Made in Germany, the model is hand-crafted to provide the ideal quality and comes from Fischer Instruments, a great and reputable company. In terms of reading, the model can measure the temperature of 90-250 F and humidity of 0-60%. Its case is made of stainless steel to ensure that it remains free of corrosion and rust from the humidity in your sauna. And it has a diameter of 6.3 inches and a depth of 0.98 inches. It is also a lightweight product that weighs just 0.8 pounds. The product comes with a 2 years warranty that will provide you with peace of mind when using it. But it will last for over 2 years and still continue to provide accurate readings that you have always wanted. In short, this is a pocket-friendly sauna thermometer that will last for decades. Sauna thermometers come in different shapes, sizes, and types. So, you need to know the one that will best satisfy your needs. A residential sauna thermometer is small and is similar to a traditional thermometer; in term of size. This type of thermometer is made of materials that easily handle the heat and condense inside your sauna without leading to any problem. A commercial thermometer is larger and able to handle energy and power released in huge saunas. If your sauna is dry, you can buy a temperature gauge thermometer in digital or dial format. If your sauna is a traditional steam one, you should consider having a hydrometer together with the thermometer. You can easily find gadgets that offer both the thermometer and hydrometer in one device (we have reviewed some of them). They will offer you a faster and easy reading all the time. If you find that your sauna has high humidity, it means that there is excess steam in the room due to the extremely hot rocks. The hydrometer and thermometer combination will help you to improve the condition of your sauna, making it safe and more comfortable. One main feature that you should look into when buying your sauna thermometer is the readability. 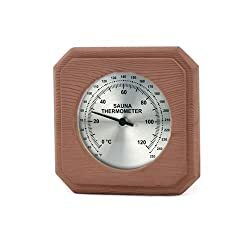 The ideal thermometers for sauna come with solid wood for the base, clear and large numbers, and an identifiable gauge needle. The readability and clarity of your thermometer are critical since you will mount it near the ceiling. You should be able to read the readings of the device from below. Some sauna thermometers come with a glass that is moisture proof. Always ensure that the sauna thermometer you buy is water resistant. This means that the gauge shouldn’t fog up when it comes in contact with humid air or steam. If your thermometer isn’t watertight, it will be of no use. Additionally, ensure that the model you buy can easily survive in the heat of the sauna. This means avoiding sauna thermometers made of fiberglass and acrylic covers because they easily loosen and expose the thermometer. Another thing, your sauna thermometer should be able to adjust to temperature variations that might occur suddenly, especially when you open your sauna door. Always remember that your sauna thermometer does not adjust the temperature of your sauna – it only shows you the readings. Hence, you need to adjust the thermostat accordingly. Which is the right place to install a sauna thermometer? The best place to hang your sauna thermometer is the place that will allow you to see the reading clearly. It should be near your head-height: not close to the ceiling or close to the floor (hot air is near the ceiling and cold air is near the floor). As well, put it away from the sauna door because it will easily cool down when you open the door. And it should be far away from the heat source. The best sauna thermometer should be affordable, offer reliable readings, and last longer. You can easily find a model that will provide all these features on the market today. In case you are still stranded, consider one of the models we have reviewed above and you will have a great experience will inside your sauna.